I’ve been wanting to invest in a winter coat for a while now. We may only be creeping into autumn, but I absolutely adore the thought of a warm coat and those two girls (above) are one of the reasons I find layering up in the winter so fun (style envy x100000). Plus, I know the sooner I invest in a warm coat, the better price per wear I get! As it’s a main piece to anyone’s wardrobe, I find that an impulse buy would be completely wrong. Therefore it comes with plenty of thought, and I’m still undecided! I already have a leopard faux fur coat that’s seen about 5 winters, and the typical uni-student fur lined parka. Now I’m looking for something inbetween; a coat that’s warm but can be dressed up or down, and I’ve currently got my eyes on two. These are my picks! 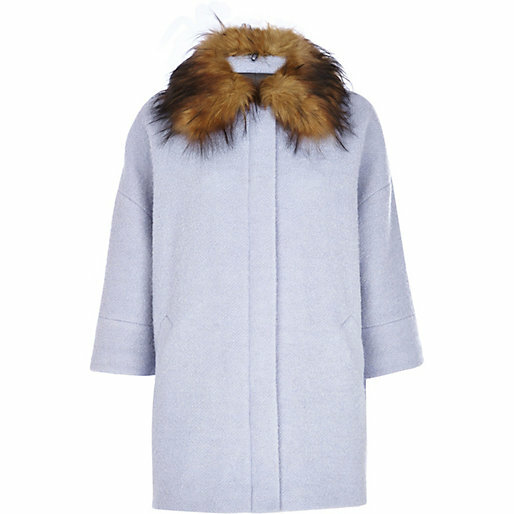 Can you see I have a thing for pale blue this A/W? I’m not sure why, but I’ve fallen in love with the colour. First up is this New Look Funnel Coat. I saw this on ASOS’s new in page a good few weeks ago and it’s been sat in my saved items ever since. I love its classic shape, while it still looks super chic. The bonus with this is that it’s the cheaper option, and I can still sneakily use my student discount! I wish it wasn’t from New Look as I know there’s a great likelihood of bumping into someone in the street wearing it… and I absolutely hate that when it comes to such a major piece of your wardrobe! I’ve been eyeing up this River Island Oversized Wool Coat for just as long. I am in love with the 60’s style and the periwinkle blue colour is gorgeous. The fact it comes with a fur collar is a bonus too. It didn’t help when it popped up on my Bloglovin’ page as That Pommie Girl was rocking it in an OOTD! I am slightly fearful that a million and one girls will have it now however it’s not stopped me from wanting it. So what are your thoughts on the coats I’m lusting after? It really depends on the temperatures of the place where you’re leaving and also on your personal feeling, of course. On my point of view one should have a choice between 2 items: a basic coat, to wear as an everyday solution and a more special one, for the glamorous occasions. Personally I tend to use black / dark tones for the everyday and pastels or white for the special ones. I also like the little faux fur details and why not, even the entire faux fur coat. There are some pretty ones around..